The west slope of the North Menan Butte down to the banks of the Snake River was the favorite ranch purchased by Our Great Grand father, Louie Hartert, (L.A. Hartert) in 1939. Eventually it covered about 2500 acres. The low ground was very wet and marshy. This was the former bed of the Snake River before the eruption of the Menan Butte in the middle of the River! This caused the re-routing to the south of both Buttes as it is to this day. This Lake, or Slough was home to a large Muskrat population. The former owners fenced the lake with “rat fence” that went into the ground and a “T” top that prevented the muskrats from tunneling under or climbing over the fence. Eventually the population was so large that disease struck the furry little animals. Around this time, the late 1920’s, the ladies of the land no longer found the muskrat fur fashionable. This combined financial situation led Louie to purchase the property. He was successful in raising cattle and crops on it passing it down to Richard Boyle, his Grandson. The ranch was sold to several Federal agencies in 1999. The Federal people wanted to protect the wetlands, the many birds nesting there, and the Riparian habitat along the Snake River. The Idaho Fish & Game now manages the property, some remaining as farm ground. 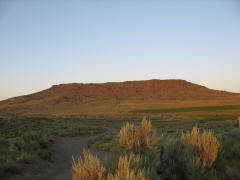 The Menan Butte remains a special memory for those of us that spend years enjoying this view. We still enjoy a hike to the top to gaze into the crater, and look over the “Ranch”. 3800 ft of a 12,000 ft building. Space is open at present. 2 overhead doors, one street level & one loading dock. Glass entry way door for front office. 22 ft ceiling.